Theo Paphitis launched Small Business Sunday to generate exposure for small businesses in the United Kingdom. Since the initiative was launched in October 2010, Theo Paphitis has helped several hundred SMEs, giving them free exposure to his fans on the social networking site, Twitter. At the time of posting this article (May, 2012), Theo Paphitis has 245,000 followers! You can enter Small Business Sunday at no cost. Simply tweet your business idea to @TheoPaphitis, being sure to include the hashtag #sbs. You must do so between the hours of 17:00 and 19:30 on any given Sunday. Winners are then re-tweeted the following evening, between 18:00 and 20:00. If you’re lucky enough to win, your handset will explode with Twitter notifications! Why do I care about Small Business Sunday? 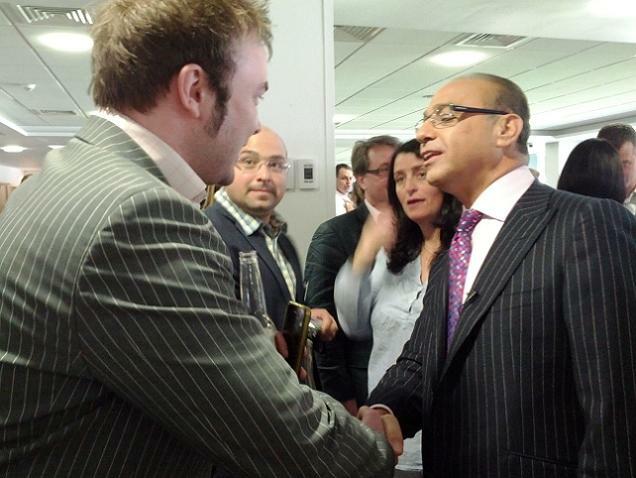 I was one of the first winners of Small Business Sunday, being re-tweeted by Theo Paphitis on 30th October, 2010. As a result of the ‘RT’, my website nearly fell over, I picked up a load of new Twitter followers and a heap of business opportunities came my way. As if that wasn’t enough, I was lucky enough to meet the man himself at the Inaugural Small Business Sunday winners’ event, which was held at Edgbaston County Cricket Club on 30th March, 2012. In an effort to give something back to the #sbs community, I now offer free advice to the weekly winners. The primary focus is on search engine optimisation (SEO), although I have touched upon conversion rate optimisation (CRO) and broader business topics. If you’re an #sbs winner and would like your SEO freebie, all you need to do is leave a comment on this blog post, letting me know your website URL and your Twitter username. The advice is completely free and #sbs winners are under absolutely no obligation to do anything with it. Click here to see an exhaustive list of Small Business Sunday winners. This #sbs winners list is maintained by Virtual Business Centre, who also publish comprehensive statistics regarding Small Business Sunday entries to their Twitter feed. If you’ve been lucky enough to get a re-tweet from Theo Pahitis, you can connect with other #sbs winners through the official website: theopaphitissbs.com. If you haven’t received your log-in details, you can get them from @RymanStationery.